Home » PrinterFace – Features and benefits, your questions answered! PrinterFace – Features and benefits, your questions answered! PrinterFace is the premier product for managing in-plant print rooms, organisational print management, small to medium commercial printers, corporate, government and education print procurement – and here’s why, PrinterFace is the most complete print management system. PrinterFace unique features cover your print requirements, let’s play 20+ questions (hint, the answers are all ‘yes’). Is PrinterFace easy to use? Yes! PrinterFace is designed from the ground-up to "get the print order". If you're not getting orders, you're not printing anything! PrinterFace uses simple processes, easy to understanding icons, and helpful hints and tips. It can provide real-time pricing and proofing so you're not on the phone all day helping clients out. It also checks and builds the print buyer's job ticket the whole way through, because we know print and they don't (they shouldn't have to!). With PrinterFace your users can connect to your site, and place orders with no training or confusion. They'll be ordering print products on day one! Can PrinterFace: be customised to match our print capabilities? Yes - PrinterFace is your web-to-print solution. We reflect your business capabilities and options for your print buyers. If you don’t offer comb binding, cello glazing it's gone. But, perhaps you can print colour on 300GSM then that’s what PrinterFace will show! This means any options that your clients can see, anything they can click, you can produce. Clients can be confident in the ordering process, and you know that job tickets arrive complete and ready to run. Can PrinterFace: be styled to match our existing website? Yes - PrinterFace sites can be ‘skinned’ to match your brand and your identity. PrinterFace can also be ‘dual branded’ you can have your identity and your client’s logos on the same page. One system, many faces makes it easy to integrate PrinterFace as your print management tool into your existing identity. This means PrinterFace can fully represent your business identity online, while still making your clients feel ‘at home’. Can PrinterFace: handle specialty stocks and complex printing options? Yes - PrinterFace can handle any stocks, options and finishes you offer for your business. Your clients can have their custom offset printed shells on-hand, or your book binding covers can be available to the clients of your choice. PrinterFace can even customise your stocks, perhaps your client ends a specialised cover page for certain types of document? PrinterFace can handle any combination of stocks, printing options and finishes. This means, you can confidently tell your clients ‘yes’ we can handle that for you. Can PrinterFace: handle approvals and authorisation process? Yes - We live in a world where business rules and good governance dominate. We understand that end-users don’t want to have complex authorisation processes, but the reality is that most organisations want checks and balances in place. need marketing approval for wide-format? need finance approval for jobs over $5,000? 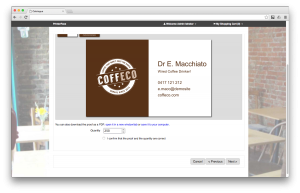 Do you want your clients approving digital proofs? Yes, PrinterFace is strong in process management. Best of all it’s no-fuss for print buyers, admin and print management staff. Once you have the order, you know you’re ready to print because it's approved and authorised! Can PrinterFace: manage our production workflow? Yes - The same system flows from print buyer, to production - and through many other processes between! Best of all, each process can have man steps, how do you print? How do you pick and pack. PrinterFace workflows give your business the tools to manage any print process. Can PrinterFace: provide fast and accurate quotes? 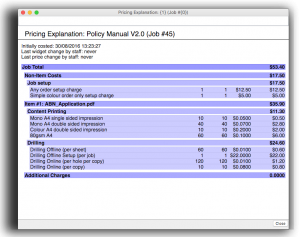 Yes - At the heart of PrinteFace is a powerful pricing engine. Do you print on SRA3 and guillotine down to A4? What if the job needs full bleed? Does the job use parts or process from one of your suppliers? What’s the maximum can your bind online? PrinterFace can give your clients real-time pricing so you’re no on the phone going through every little print option. Alternatively, just use the price engine internally, quote your customers the old-fashioned way, but make it streamlined! In addition, PrinterFace's power "explain-prices" tools can tell you exactly what production processes will run for any job, and how each job's pricing is built. Regardless of the part or process: online or offline, in-house or outsources. Their print-options, your business process, price and margins = a ready to go quote! Can PrinterFace: produce reports and analysis? Yes - PrinterFace captures so much data you’d have trouble believing it. Your PrinterFace can report on how many jobs you did for each client, how often they rejected proofs, if your suppliers are delivering on time, how long a job is stuck “in approval” - seriously, we can report on any data we capture! PrinterFace reports are custom built to give you the tools to understand your KPIs and manage your productivity. PrinterFace reports can also keep print buyers and their admin staff ‘in the loop’. Why not make the job easy for your clients, give them the reporting they need at their fingertips. This means your data can be brought to life, so you know how your business is operating. Can PrinterFace: integrate with finance, IT and other systems? Yes - There’s no need to re-invent the wheel! PrinterFace can hook in with many off-the shelf, corporate, IT and finance systems. We can take data from your internal systems to help pre-populate business cards, or restrict access to cost centre codes and delivery address. No problem. Integration improves data quality, business rules and governance. You don’t need to administer PrinterFace if you have other systems that do it better! Can PrinterFace: be run without buying an expensive server? Yes - You can be up an running with zero infrastructure all on the cloud! PrinterFace is sold in two ways, either you buy your own server and host it locally, or we host it on our Amazon AWS cloud server. This means you can choose what options suits for your requirements. Up and running on the cloud means you have no additional infrastructure costs and no Internet outage issues. Your clients can access your site and buy your products any time, day or night. Can PrinterFace: handle complex offset quote requests? PrinterFace can manage the quote-request-cycle for even the most complex print jobs. One system can manage clients from a single A4 document, to a complex publishing and distribution deal. Can PrinterFace: accept jobs from a print driver (file/print)? Yes - Sometimes you want print to be as easy as “file, print” - PrinterFace can do that. We call this "Print Driver Integration" - where users can print directly to their PrinterFace (from their desk, or even at home!). Print driver integration is a favourite for corporate, small government, and educational users alike. By capturing this work at the ‘print driver’ level, we can save your clients and your business money. There’s no need to have end-users nursing small print devices, racking up hidden labor and opportunity costs when they could be doing what they’ve been paid to do. 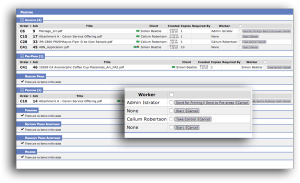 Can PrinterFace: manage our suppliers and outsourced work? Yes - Everyone has suppliers and partners, but how do you manage them? Your small print management operation can harness the capabilities of the big-end print providers. Conversely, if you think big, there’s no reason you won’t need specialty services from some little guys. PrinterFace manages the whole print process from start to finish, regardless of how complex that process is. Can PrinterFace: send easy jobs straight to a device? Yes - PrinterFace can drive simple jobs straight to your devices. From desktop to hard-copy with minimal human intervention! You’ve heard of the 80/20 rule or the Pareto principle? Yeah, we’re not a fan of marketing buzzwords, but unfortunately in many cases, these rules apply. PrinterFace can send your “money for jam” jobs straight through to print devices. You can have your print operators ‘release’ jobs to specific hot folders, or send the high-value work through for pre-press and more complex production. This gives you the freedom to churn out the boring stuff, while you spend time on satisfying print buyers with more complex requirements. 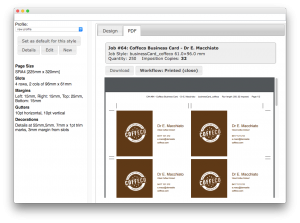 Can PrinterFace: handle PDF template jobs like business cards? 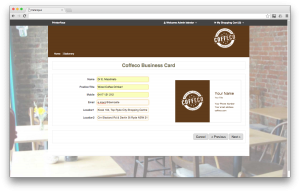 Yes - PrinterFace handles complex templates for business cards, with compliments slips, envelopes, cover pages and more. This means you can accurately match the business rules and identity for your client’s printed materials. PrinterFace can pre-populate whatever data it knows about, and place it accurately on your template. Best of all we provide your clients with a PDF proof, and then deliver your print room and imposed and ready to run job. Can PrinterFace: be used like a shopping cart for all our products? Yes - PrinterFace can handle pick and pack for the jobs you warehouse, or just-in-time delivery for those of you who don’t. 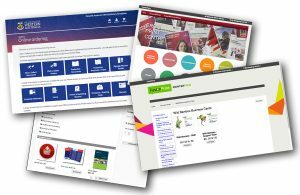 Your clients can browse your catalogue, add products and build a shopping cart. Once stop for al their printed requirements. Your clients and users will know that your online print shop, is the place to go for anything they need. Yes - We can have different price structures for clients. Not all clients are created equal, it’s true that some clients cost more to support and others order huge volumes and demand competitive pricing. PrinterFace can represent your price, your way. You can set up each individual client with their own pricing structure: give your regulars a discount, or give RRP for your ‘one off’ clients. It doesn’t matter how you negotiate the deal, we can back you up with a price-book to match. Can PrinterFace: provide quick-links to order common products (with minimal specs)? Yes - We want your clients to have the fastest, easiest and most welcoming print procurement process. 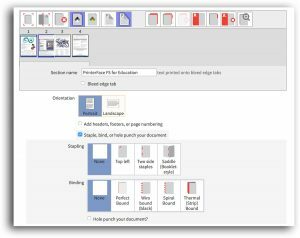 To do this, we avoid un-necessary questions, if you’re doing pull-up banner, you probably don’t care about binding or laminating options or if you're document printing you don't want to know about canvas stocks. We can take the bulk of those 80/20 jobs, and simplify them. Your users go online, into your PrinterFace site, and ordered the most common print jobs, with the least number of clicks. This means your client’s experience a simplified ordering process, and you can capitalise by directing clients to high-volume repeated work. Can PrinterFace: let my users re-order previous jobs? Yes - When your regular customers go online, they can see all their previous jobs. Because we’ve stored everything, they can simply click through and re-order their favourite work. PrinterFace can check the files for changes, and even update pricing if it has been a while. We can show the user through the ordering process, and even allow them to make changes if necessary. Better still, every reorder job keeps all production details, your print ready files and any history notes. Your re-orders are easy to create and quick to produce - faster turnaround, improved efficiency, and better margins. Can PrinterFace: manage my ‘stock on hand’ ? Yes - We can track how many of each product you are on-hand. We can tell your clients if you're running low (so they know if they need to hurry), or we can let you know when you need to re-order. PrinterFace allow you to report on how much stock you’re holding and even lets you set trigger-levels so that you can manage your stock easily and efficiently. Can PrinterFace: handle credit card payments and account customers? Yes - PrinterFace gets your money, upfront or on account it’s up to you. or accept cash on delivery. Better still, PrinterFace can do any combination of these things, and the combinations can be based on your print buyer. In-hours clients, pay on account; new clients cash up front; students pay on card. You're also not exposed, PrinterFace uses industry best practice to verify credit card transactions, we let the banks do all the work, so we never have to handle a print buyer's credit card! PrinterFace integrates with payment gateways and finance systems to make sure you’re not letting valuable work slip through the cracks.